We’re now 3/4 of the way through reviewing 2014. It’s been a fairly good year. September led to being a little more stressed out (which would come full circle in October), but overall it was still good. Way better than 2013! I forgot about the virtual race I ran. I completed it in June, blogged about it in July. Vacation happened! We spent several glorious days at the beach. I need to plan this summer’s vacation. We visited Charleston. One of my favorite cities on the planet. Ah. Mommy & Me Monday. This was a fun post and I need to do more of them in 2015. I ended the month with fun bento foods for toddlers! I love creating fun lunches for my son to eat. Kristan Higgins became one of my favorite authors. I still read her books over and over. I finally blogged inside the layoff. I was gearing up for #TypeACon – and I had NO IDEA how much fun I was about to have the next month! Old School blogging! It was all about summertime. The best time. If you haven’t tried basil hummus, you are missing out. Pin this post and remember it next summer. The local splash pad was closed most of the summer, so we converted our back yard into a splash zone. I got to blog about Matt Nathanson and that excites me to no end. We transferred the toddler to his toddler bed. It went…ok. He still doesn’t try to get out on his own (he has no rails. He totally can get out.) And Friday morning, I heard him yell, “I don’t want a big boy bed!” So…that’s interesting? Type-A Conference happened. #RoomCon forever. I met the best people and reconnected with friends from the previous year and these ladies are the best of the best. I can’t believe we’re at the end of 2014! So many incredible things have happened the past 3 months, which I’ll share next week. Great wrap up! I think I’m going to pass on a second color run too… 🙂 Too much BLUE! Those dino pops are so cool. I am glad you guys have had a great year and here’s to a great 2015. A virtual race, how fun! I need to try one of those. And woohoo for vacations, they are the best, aren’t they? Your lil man is so cute and his party sounds amazing! 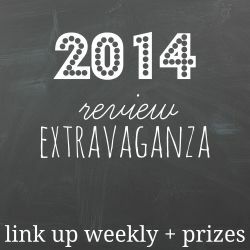 Stopping by from the recap linkup! I’ve been having a really hard time this year. I should go through and make a ‘good’ year in review post. Your’s was inspiring. Love the dino pops! As for running in any race–I’ll pass. You sound like you had a great couple of months there. What a great summary. I love your backyard splash area! Love the Mommy Monday. Those days like that I think mean so much more to our kids than we will ever really realize. So fun that you got to go to a blogging conference again, glad you had a great time. Those dino’s for his party are so fun! Glad it was a great three months.